“It is very important to submit the highest quality images of your artwork,” says Santa Fe Indian Market Chief Operating Officer, Dallin Maybee. “Indian Market is highly competitive and artist applicants represent the best Indian artists in the world." Santa Fe Indian Market, the world’s oldest and most prestigious juried Indian art market, has been the benchmark for quality and authenticity for close to 100 years. 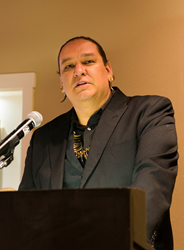 In 2015, Santa Fe Indian Market updated its jurying criteria in an attempt to make the process more equitable and address issues that occurred with the previous scoring method. Artists can apply for admittance to the Santa Fe Indian Market in any of the ten traditional and contemporary categories: jewelry, pottery, sculpture, textiles, paintings, wooden carvings, beadwork, baskets and diverse arts (drums, bowls, arrows, and cradle boards, etc.) and moving images. A panel of three experts, in each market classification, scores the submitted artwork evaluating technical execution, concept, aesthetics and Indian Market Standards — the artist’s previous awards and accolades are not considered. “It is very important to submit the highest quality images of your artwork,” says Santa Fe Indian Market Chief Operating Officer, Dallin Maybee. “Indian Market is highly competitive and artist applicants represent the best Indian artists in the world. It is exciting to see the art that artists submit in order to demonstrate the high-level work they are producing,” he adds. Santa Fe Indian Market jurors are a selected group of accomplished artists, museum curators, critics, and art experts of unbiased professionalism. Joan Caballero, an American Indian Art appraiser, has been associated with SWAIA (the organization that produces Santa Fe Indian Market), since the late nineteen eighties serving as a volunteer, juror, and board member. This year, Caballero acted as one of the jurors in the textile category. “My experience last Friday, and my previous experiences, are that the judging is very well organized and well presented by Dallin and the staff,” said Joan Caballero. “This year’s entries were a good mix of seasoned, traditional offerings— by artists who are extremely aware of their materials— to what felt like very young applicants with bright ideas and new innovations,” added Caballero. Since 2015, Santa Fe Indian Market also considers the number of accepted artists in each classification, so that a diversity of mediums is represented at Indian Market. This year, the new jurying criteria and the updated point scoring system--which allows judges to award artists a total of 300 possible points—is intended to remove bias and avoid similar scores among applicants. This year’s Indian Market takes place August 20-21, 2016 in downtown Santa Fe.